V ROD - VRSCD - Night Rod. Oil & filters 1600 miles ago. Harley Davidson 48 sports. Recent service by Swansea Harley Davidson. Model - Forty Eight XL 1200 X 13. Mustang single leather seat. Belt drive. 2007 Harley-Davidson VRSCX Screamin' Eagle V-Rod. 1 Owner From New! A rare opportunity to obtain a very nice Harley chopper with a custom paint job on the original tank other original parts are saddle,engine/transmission. 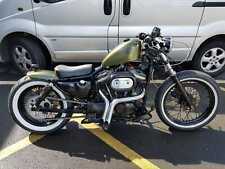 Harley Sportster XLH883 2003 Anniversary, 16,500m, 1 owner £1000's spent SUPERB! H-D panniers/saddlebags. They are probably the largest panniers ever made for the Sporty and they were eye-wateringly expensive. After the first free service I have always done the servicing myself, per the maintenance schedule or better. Has been fully serviced inspected & all fluids changed at Warrs Harley Davidson 11-August-2018. LePera King Cobra seat (new). Original front fender ( not in photo ).